Cast iron, spiral riveted, square welded? As the most expensive component of the scheme, the pipes to be used in the 350 mile long pipeline required careful consideration. Cast iron would be too expensive and difficult to transport so was ruled out. Tenders were invited for steel pipes – longitudinally riveted in low pressure areas, welded thicker pipes for higher pressures. 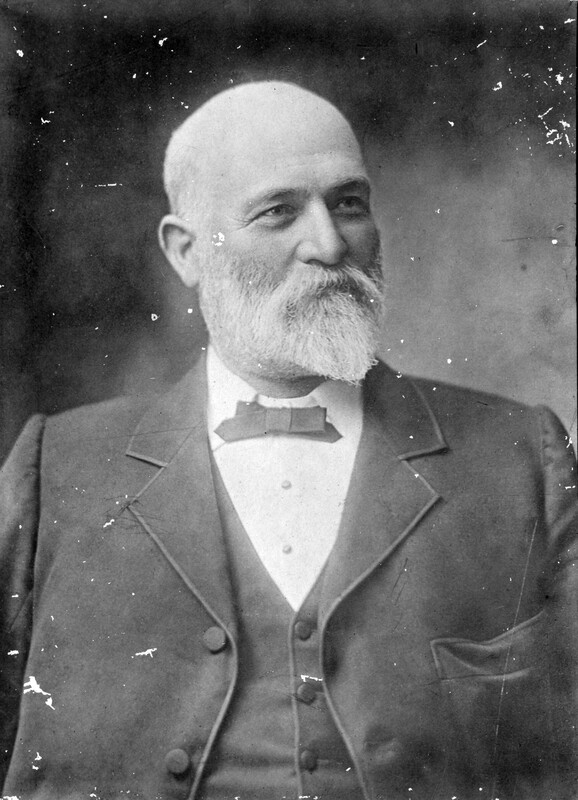 Tenders were invited to suggest and submit prices for any other type of pipe – Melbourne engineer Mephan Ferguson suggested his innovative locking- bar pipe. Late one night in 1896, Mephan was sitting at his desk with his son beside him. He opened a drawer and observed the dovetail joints. He hit on the idea of using a similar joint in steel. Suddenly he struck the desk with a mighty blow and said “I’ve got it, Bert, I’ve got it!” It was fortunate that Bert did not strike the desk at the same time, as both Mephan and Bert were big men, each with chests measuring about 140cm in circumference. Mephan at once produced a piece of lead and in a few minutes made a model of a lock bar joint. In the morning a joint was made in steel at the works and, when tested, proved to be a 100% efficient joint. 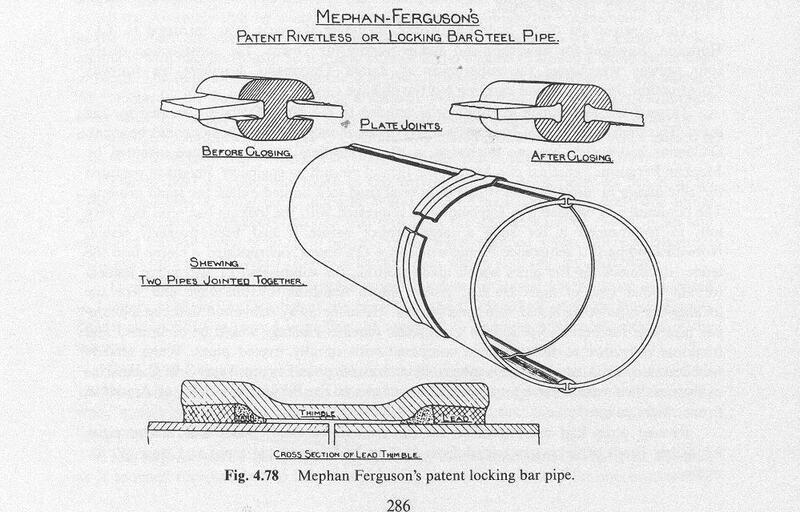 Mephan quickly patented the process and planned a production line suitable for the mass production of pipes. Steel for the pipes came from Germany and America in flat sheets, the locking bars from England. To make a pipe, the longitudinal edges of two 28-foot long sheets were ‘burred’ to the shape of a dove-tail and the sheets bent into semi-circles. A locking-bar with H-shaped ‘open jaws’ was fitted over each longitudinal edge of one semicircular plate held in half circular cramps. A second plate was inverted and lowered until its edges rested in the upper grooves of the two locking bars. Cramps over the top connected to the bottom cramps and the pipe thus formed was fed through a hydraulic machine that pressed the locking bars on to the plates, closing the ‘jaws’. 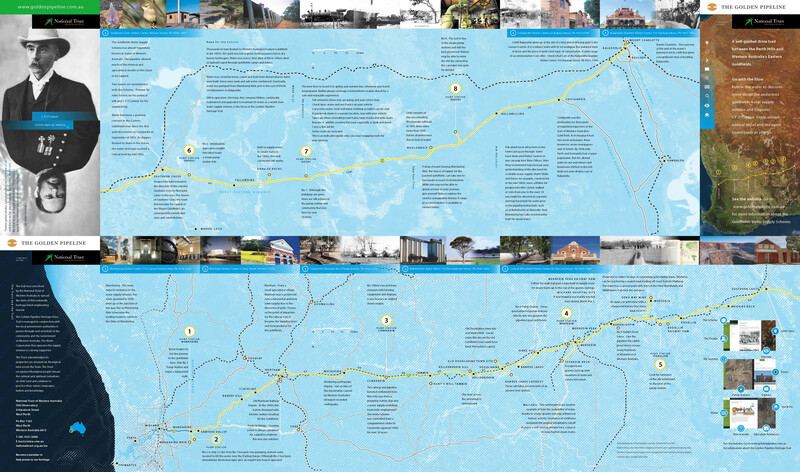 Where possible the pipeline followed the existing railway line which had reached Kalgoorlie by early 1897. This meant that the pipes, the length of which had been determined by the length of the rail trucks, could be transported from the factories by train and unloaded as close as possible to where they would be laid. Where the pipeline deviated from the railway, the pipes were unloaded at a siding and transported from there by horse, and sometimes camel, drawn wagons.